We tend to imagine that organised attempts to make the world a better place are almost always successful, at least to some extent. However, this is simply not the case. We think that charities can easily fail to have impact, even when they’re doing exactly what they say they are. In fact, our review of academic research has led us to believe that many of the problems charities aim to address are extremely difficult problems that foundations, governments and experts have struggled with for decades. Many well-funded, well-executed, logical programs simply haven’t had the desired results. (1) The vast majority of social programs and services have not yet been rigorously evaluated, and (2) of those that have been rigorously evaluated, most (perhaps 75% or more), including those backed by expert opinion and less-rigorous studies, turn out to produce small or no effects, and, in some cases negative effects. Even within areas where interventions do work, the differences in effectiveness are often significant. The Abdul Latif Jameel Poverty Action Lab is a network of over 100 academics who carry out rigorous impact evaluations of interventions within international development. 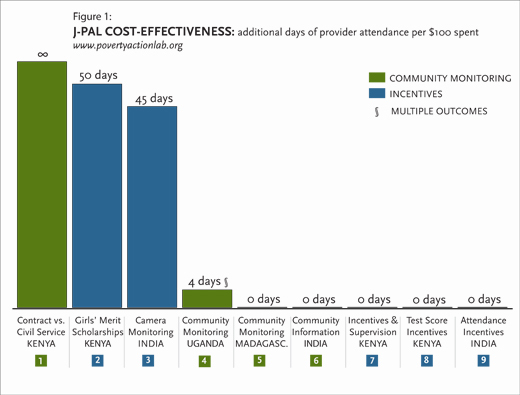 Within a program area, they often find that the best interventions are more than ten times as effective as others with the same aim, even when excluding entirely ineffective programs. Moreover, these differences are hard to predict ahead of time. Most social interventions that end up being evaluated were originally supported by experts and governments, were executed on a wide scale and are widely thought to work. But when tested rigorously, they turn out not to. Looking back on several decades of impact evaluations, we can see that good intentions and passion alone aren’t enough. Rather, we need a strategic approach that makes use of data where it is available, or seeks to gather data where it is not. It’s not that we should only focus on already proven interventions; rather, we should focus on implementing the best interventions we know given the evidence, or searching for new interventions that might be effective and testing them out. Our solution is our framework for assessing causes, which helps you to evaluate which areas to focus on. We also think it’s important to stay flexible about which causes to support, because new information is always coming to light about the most effective interventions.